+91- 4366-247 824, +91- 94424 03391. 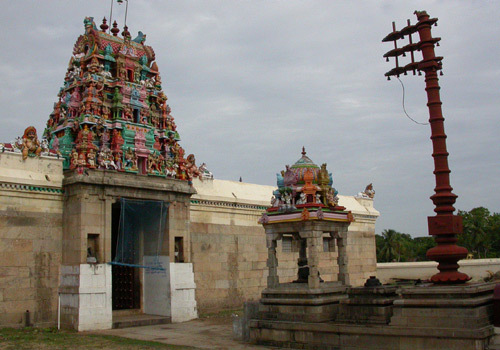 There are two sacred springs – Brahmma Theertham and Sesha theerthams created by Lord Brahmma and Divine Serpent Adi Sesha. Brahmma created the spring for his Shiva worship for relief from a curse. 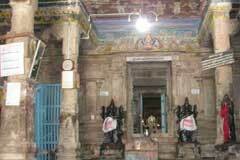 Adisesha passed through a well in the temple to the sanctum to worship the Lord and thus Sesha Theertham came into being. Those suffering from vision problems bathe in the former with a herbal mixture offered in the temple and consume also the fig-honey Prasad for cure while those with skin defects consume the Sesha Theertham Prasad offered on full moon days. 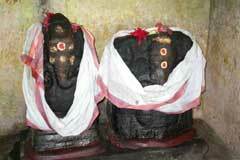 There is also Kadukkai Vinayaka in the temple. Kadukkai is a nut with medicinal value and is used to be powdered and put in muddy water to make it crystal clear. This is also used as a medicine for cleaning stuffed belly. A trader stayed in this place with bags of Jadhikai also a medicinal nut that attracted higher tax. Vinayaka in the guise of a boy came to the trader and asked him about the contents in the bag. To avoid higher tax, the trader said that the bags contained Kadukkai. All the contents were found to be Kadukkai. Realizing that the boy was Vinayaka, the trader begged his pardon. They became Jadhikkai again. Since that day, the boy Vinayaka came to be known as Kadukkai Vinayaka. 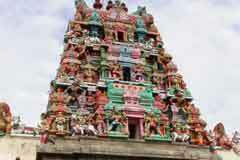 The temple celebrates special pujas on Tamil New Year day falling almost on April 14, abisheks to Lords Thyagaraja and Nataraja, pradosham days-13th day of new or full moon fortnights, Sankatahara Chaturthi-the 4th day of new moon fortnight, Jupiter worship on Thursdays, Lord Muruga pujas in Karthikai-November-December, Kalashtami Bhairava Puja, New Moon and Full Moon days. Dangam means the tool of the sculptor. Vidangam means ‘without sculptor’s tool’. That which comes naturally without the use of dangam or sculptor’s tool is called Vidangam or Swayambu. Seven places with such Vidanga or Swayambu Lingas are called Saptha (seven) Vidanga Sthalas. Indira won a war against the demons with the assistance of Emperor Mushukunda. As token of his gratitude, Indira wanted to present a gift to the emperor and asked him what he expected. Mushukunda asked for Vidanga Linga Indira had. Indira did not want to part with that valuable asset. He thought of making 6 such Lingas with the help of the divine sculptor Maya to present them to the emperor. He made them ready. 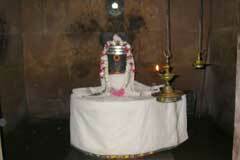 Mushukunda, with his own divine power found the real Linga with its fragrance of Sengazhuneer flower. Realizing the play of Lord, Indira gave all the seven Lingas – 1 + 6 to Mushukunda. Mushukunda installed these seven Lingas in Seven places. These places are praised as Saptha Vidanga sthalas. 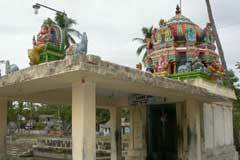 They are 1) Veedhi Vidangar in Tiruvarur; 2) Nagara Vidangar in Tirunallar; 3) Sundara Vidangar in Nagapattinam; 4) Avani Vidangar in Tirukuvalai; 5) Neela Vidangar in Tiruvaimur; 6) Bhuvani Vidangar in Vedaranyam and 7) Aadhi Vidangar in Tirukaravasal. Lord Shiva graces his Kukkuda dance in this place. 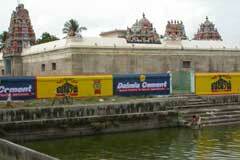 Mother Mahalakshmi, Indira, Sages Kabala, Patanjali and Vyakrapada had worshipped Lord in this temple. Lord Dakshinamurthy is praised as Gnana Dakshinamurthy. 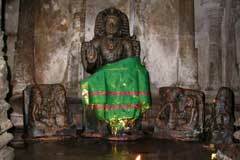 Devotees believe that Lord Swarnakarshana Bhairava will help them recover the losses they had incurred. The place was dense with Karahil trees during the puranic period, it is said. Hence, this was named Tirukarahil and changed later as Tirukaravasal.